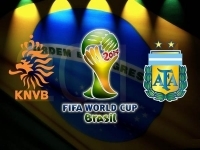 This afternoon the Netherlands will play Argentina for a chance to compete against Germany in the World Cup Final this Sunday, July 13th. The match will be the fifth between the countries in the world finals, the first of them coming at Germany 1974, from which the Dutch emerged victors. Argentina earned revenge four years later beating the Dutch in the Final. This afternoon at 4:00 pm the Dutch will try to re-claim their title in what is bound to be an exciting follow-up to yesterday's defeat of the Brazilian men's team. Come grab a slice and join us at Duke's for the game!